In August, I met up with a friend at Sous le Parasol, a tiny perfume boutique in a decidedly non-chi-chi Parisian neighborhood. The boutique looks like it hasn’t had a branding update since 1966, and its logo and throwback storefront needs only Jeanne Moreau in a trench coat to shine in a nouvelle vague movie. Naturally, my pulse leapt at Sous le Parasol’s glorious retro-chic décor. But what really got my heart racing were its shelves of cheap thrills. David Hasson, a Spanish perfumer, founded Sous le Parasol in 1936. He stocked his shop with his own colognes and blended them at his laboratory in Burgundy from materials from Grasse. The founder’s son still makes the boutique’s fragrances, and the granddaughter runs it. Aside from a few original compositions like Premier Violon, Sous le Parasol’s in-house colognes include classics, such as Fleur de Tabac and Lavande, and soliflores like Muguet, Rose, and Oeillet. They also make a satisfying chypre called, simply, “chypre.” These fragrances smell honest and lovely, and they are a bargain. I bought a 50 ml Chypre Essence de Parfum for 15 €.1 Most of the colognes are 5 € 50 for 100 ml, 10 € for 500 ml, and 16 € 80 for a whole liter. Besides their house blends, Sous le Parasol sells a few old French brands, including Piver. Piver Rêve d’Or’s old-fashioned bottle and label charmed me instantly, and the saleswoman told us it was an inspiration for Chanel No. 5. I sprayed some from the tester and made a quick decision to bring a bottle home. At 7 € 50, how could I resist? 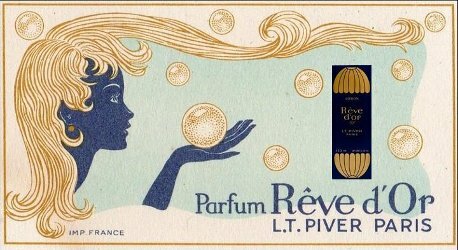 Rêve d’Or was created in 1889. Its notes include orange blossom, tea rose, geranium, vetiver, heliorope and sandalwood. 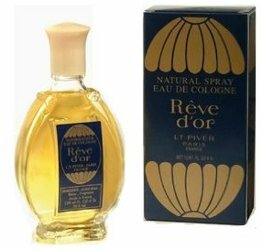 Although it was — and is — marketed as a feminine fragrance, the internet tells me Rêve d’Or was a popular lotion in barbershops in Morocco and Turkey. Plus, maybe due to its name, low price, or hint of incense, it was used in African santeria rituals and even to clean Buddha statues in Indonesia. On skin, Rêve d’Or is a warm floral with soft, creamy notes punctuated with spice. I wouldn’t be surprised if ylang ylang joined the heliotrope in its bouquet, along with a helping of carnation or clove. Rêve d’Or has a definite floral signature, its own character. If any part of it inspired Chanel No. 5, it would be the intimacy that its creaminess evokes. However, more than its spicy floral body, Rêve d’Or’s base of sandalwood, incense and a hint of patchouli stands out for me. It has a touch of the cola that I smell in Dana Tabu, but is more incense-like. I didn’t expect much for persistence, but one spray of Rêve d’Or lasts about five hours on my skin, and sillage-wise, it holds its own. You can purchase a 140 ml of Piver Rêve d’Or Eau de Cologne in its dressing-table-worthy spray bottle for less than $20 online. But if you get the chance, hop a jet to Paris and buy it at Sous le Parasol. 1. It isn’t exactly Guerlain Mitsouko, but it’s smooth and old school and inexpensive enough to dab on lightbulbs and on the hems of coats. What a delightful Paris in experience! And yes, Reve d’Or is going for not much more than a sandwich and a cup of coffee online. Gigantic bottles too, in case you have lots of statues. I’ll be scooping up a bottle. Thanks for the review. Thanks for this, Angela! I’d actually been thinking of trying (i.e. blind buying) Rêve d’Or, so now I know I have to. …And I should probably act soon, since it appears that you helped sell out supplies of the mini bottles of J’ai Osé at several online sites.???? My own mini of J’ai Osé is pretty low….uh oh. I bet there’s tons of Reve d’Or out there, though! Even if you hate it, you’re not out too much money! Oh my goodness, I am a sucker for best kept secrets, and budget priced fragrances that are under the radar. This sounds like my type of fragrance, I am a lover of heavy patchouli, incense, vetiver, rose type fragrances with a big sillage. This sounds like it fits the bill and I will be ordering. The shop sounds lovely and I will look it up when I visit Paris. Thanks for the review! It’s not super heavy, but it definitely burns down to wood and incense. If you don’t like it, you could always try a dab of the super-animatic Pompei lotion or Piver Cuir de Russie at Sous le Parasol…. Oh wow, how cool is this! I have known of this cologne since forever, as my father – when he was a young lad – used to work for …. a barber shop! And whenever he used to talk about his days at the barber shop he would gush about this lovely cologned called Rêve d’Ór. In fact, my home town houses this old style drugstore whose owner is a bit of fume head, and he actually stocks Piver. I bought my dad a bottle some years ago, and he swears it still smells the same. I am a little embarassed to say that i sort of reclaimed it (to make a decant, yeah right)… It is kind of funny, as the perfume/smell obsession gene was passed down from my grandmother via my dad, and not my mother… which i think is rather cool! Oh and thanks about the link to the perfume store in Paris; will be doing my yearly perfume pelgrimage at the end of October and will add this to my schedule fore sure! What terrific memories, and I love it that you share the perfume gene with your father! I also love it that you make a yearly perfume pilgrimage to Paris–thats perfect. Dab on light bulbs? Genius! Thank you! It doesn’t work as well on LED bulbs since they don’t give out much heat, but the formula is oil-based, which is nice. Sous le Parasol sounds charming. I hope they will have NSTers visit there in future. I enjoy another from Piver, their Heliotrope Blanc. It is sweetly comforting. An almondy floral that makes a wonderful perfume, it would also fit in well as a finishing touch at a barbershop. Lot’s in common with Reve d’Or. Thank you for the review, it is a treat to go lemming after something fabulous that won’t break the bank. I had a decant of Heliotrope Blanc once, and I used to spray it on my sheets. It was so cuddly smelling!